Say “Gumbi.” Pokey! Or, in this case, pokeberry. Pokeweed is a toxic (yet edible if prepared correctly) perennial plant with a bright pinkpinkpink stalk and dark purple, almost black berries. 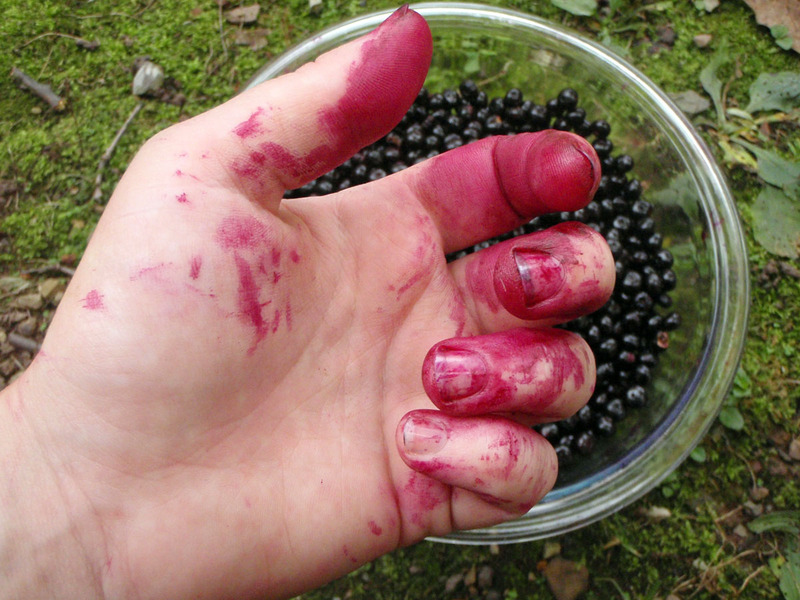 The berries produce a vibrant fuchsia juice that can be used for dye and ink. Unfortunately, the color, although striking, does not have good longevity. 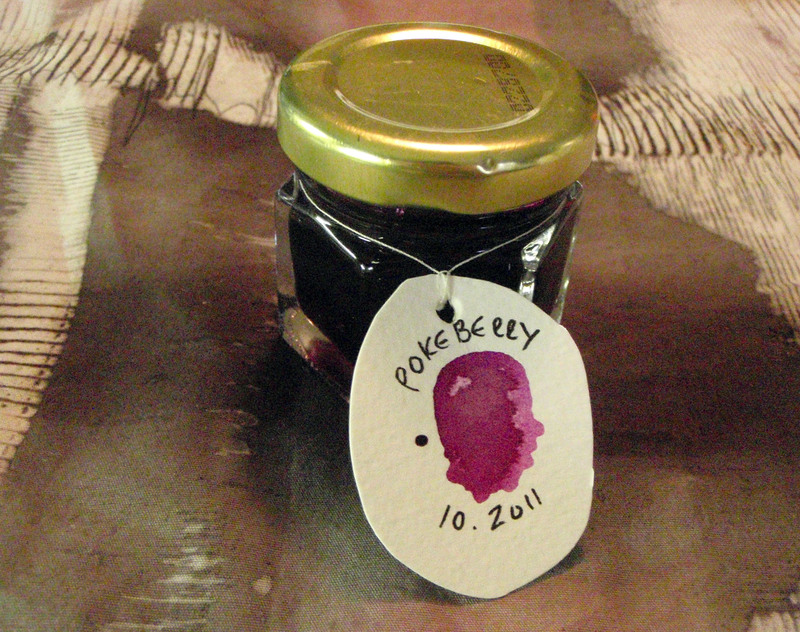 Since I’ve been on an ink making kick with the black walnuts I decided to try a pokeberry ink recipe I found through the The Fountain Pen Network (there is also an interesting discussion of the process and the ink results). 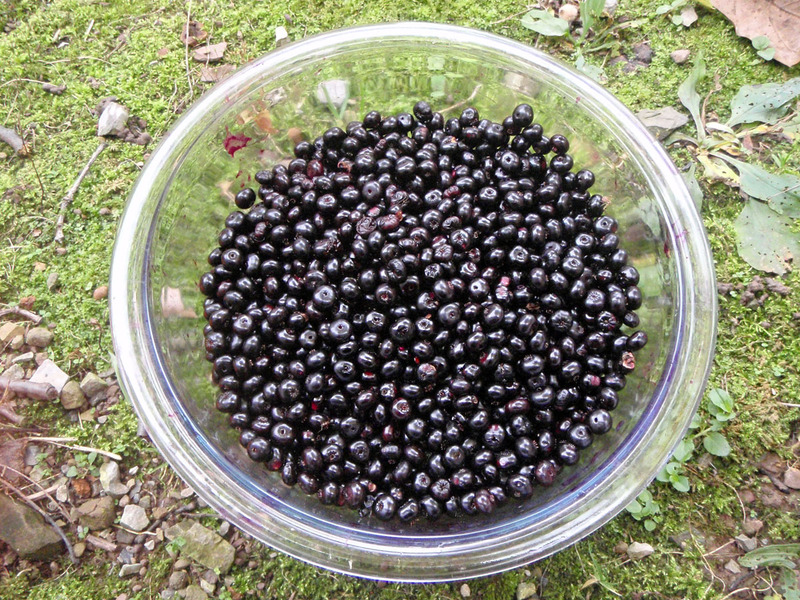 It uses yeast to ferment the berries in order to preserve the ink (although denatured alcohol might do the trick). 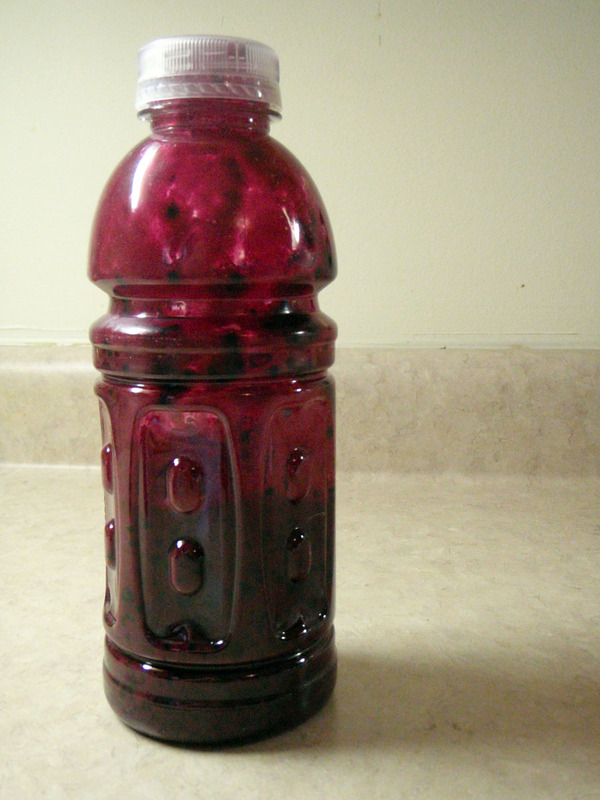 Pick and wash 8 ounces of ripe berries (I did a triple batch) and funnel into a 20 oz plastic bottle. 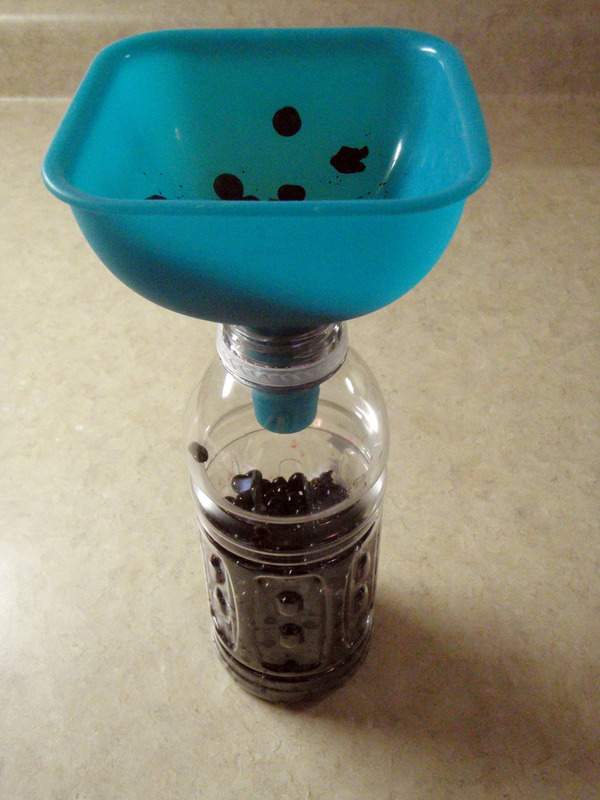 Screw on the cap and shake vigorously until the berries are pulpy. 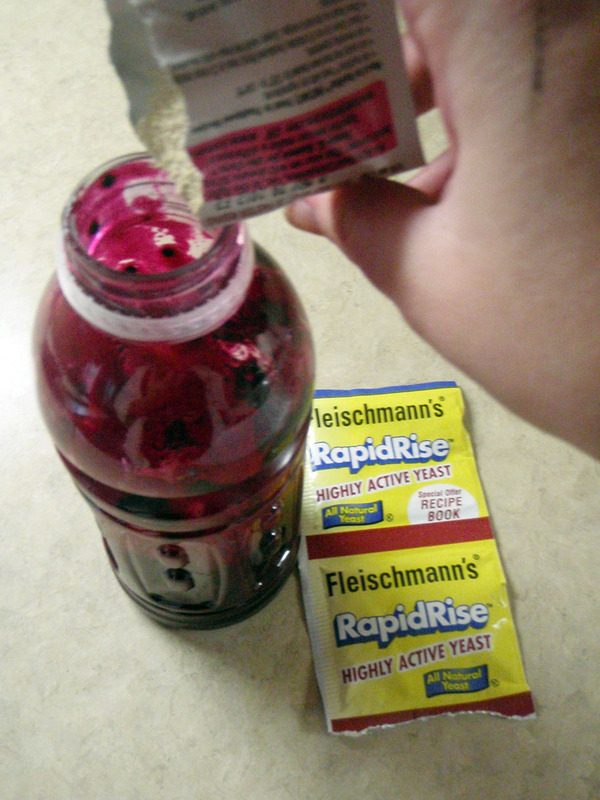 Remove the cap and pour one package of yeast into the bottle. Replace cap and shake again so the yeast is dispersed. I also put two teaspoons of gum arabic (found in powdered and solution form in most art stores) in my ink in order to emulsify the dye and help the ink bind to the page. Remove cap and replace with a square of cheesecloth and secure with a rubber band. Place the bottle in the dark at room temperature for at least 24 hours. Using a larger piece of cheesecloth, strain the contents of the bottle into a bowl. Place a coffee filter in a funnel and the funnel into a clean bottle. Slowly pour the unfiltered liquid into it. This process can take a few hours. If you are impatient you can squeeze the filter, but be gentle- the fiber breaks easily. Transfer ink into a container of your choice and store away from direct light. It’s autumn! The days are getting shorter, the squash is ready to harvest and the black walnuts are staining the roads of Central Pennsylvania. Not only do they stain the roads, but anything else they come in contact with, which makes black walnuts a popular and easy source of natural dye and ink. There are many recipes floating around on the interwebs but as long as one has walnut husks, water and heat, there should be success. Collect the desired amount of black walnuts. I used about 20 walnut husks (more will increase the concentration, less will decrease it). Put the fruit in a bucket, or bag and let it break down (I filled a bucket with water left the walnuts in it). It is ideal when the outside husks have oxidized and are completely black. The green fruit will give dye, but they are difficult to peel. Wearing a pair of disposable gloves, peel the walnuts and reserve the husks. Meanwhile fill pot about two thirds with water (I used the water from my bucket) and heat until boiling. Put the husks into the pot and simmer for an hour. After the hour is up, begin checking the color of your dye. Black Walnut gives anywhere from a pale sienna to a rich dark brown (adding iron, like nails, results in a brown-black color). When you are satisfied with your color, remove pot from heat and allow it to cool. At this point the contents look like black sludge. Place cheesecloth over a bowl and secure with a rubberband. Slowly pour the pot’s contents over the cheesecloth. 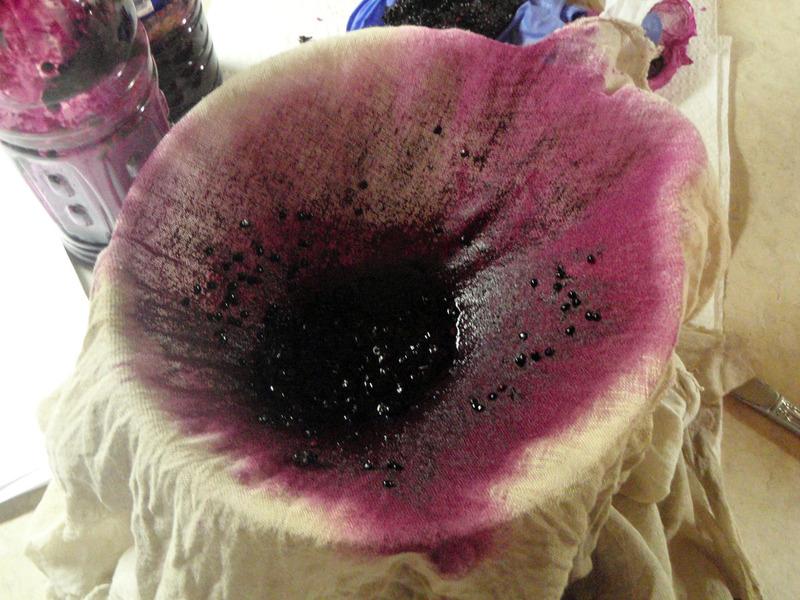 The sludge will remain on top, while the liquid filters into the bowl. 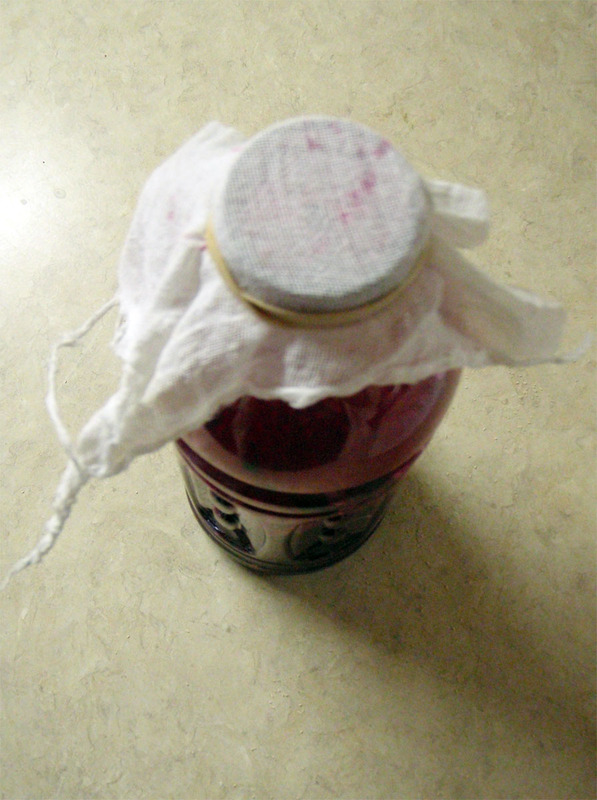 Wrap up the cloth and squeeze to release the remaining liquid. At this point I added 4 teaspoons of gum arabic to act as an emulsifier and help the ink bind to the page. To filter the liquid more finely, place a coffee filter into a funnel, the funnel into a 20 oz bottle and slowly pour in the liquid. It takes a few hours for the liquid to drip through. If you are impatient, you can gently agitate the filter, but the fibers break easily. 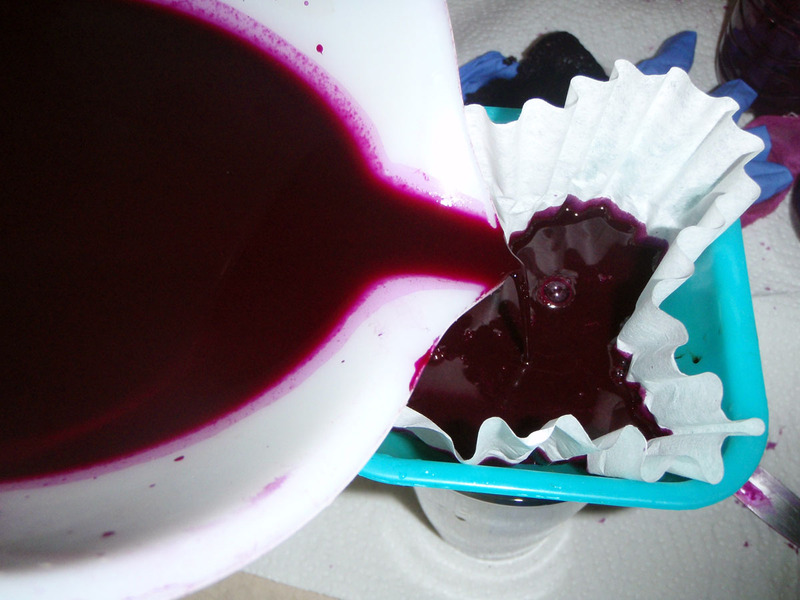 Add 5% denatured alcohol to the resulting volume of ink (for example, I ended up with 32 oz. of ink, so I added 1.6 oz. alcohol). Denatured alcohol is available at any hardware store in the paint section. This keeps mold and bacteria from growing in the ink.